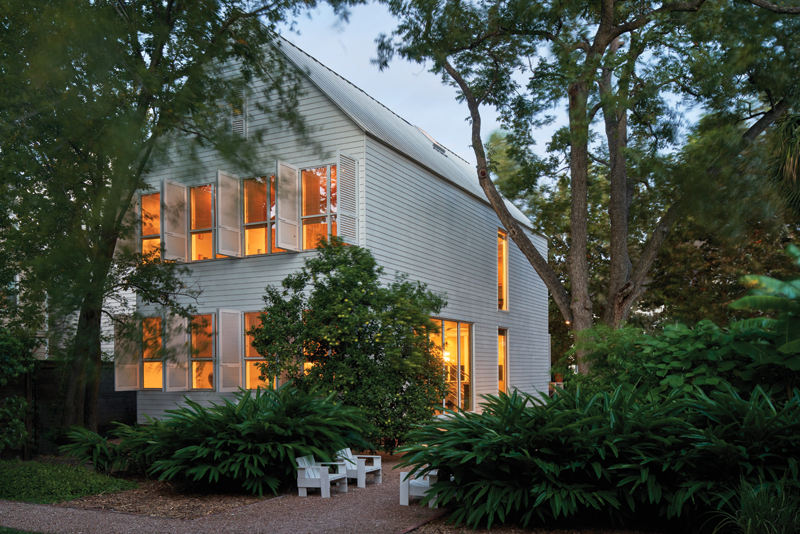 Gallerist Hiram Butler’s recently completed house at his verdant garden compound in Houston’s old West End is fascinating in that it suggests that a new, regionally inflected architecture is evolving in Houston. Houston in many ways suffers from “There is no there, there” syndrome. Architecturally, this fact is apparent in the lack of a regional architecture — in contrast to, say, the O’Neil Ford-Lake|Flato beamy, brick-and-limestone modernism that has characterized much of the output in San Antonio and Austin in past decades. Houston’s only self-created architectural statement for the 20th century has been its Tin House movement, which produced a motley collection of modest, warehouse-like buildings clad in corrugated iron sheets. Its generative monument was the Rice Museum (1969), affectionately known as the “Art Barn,” which was designed by Howard Barnstone and Eugene Aubry. 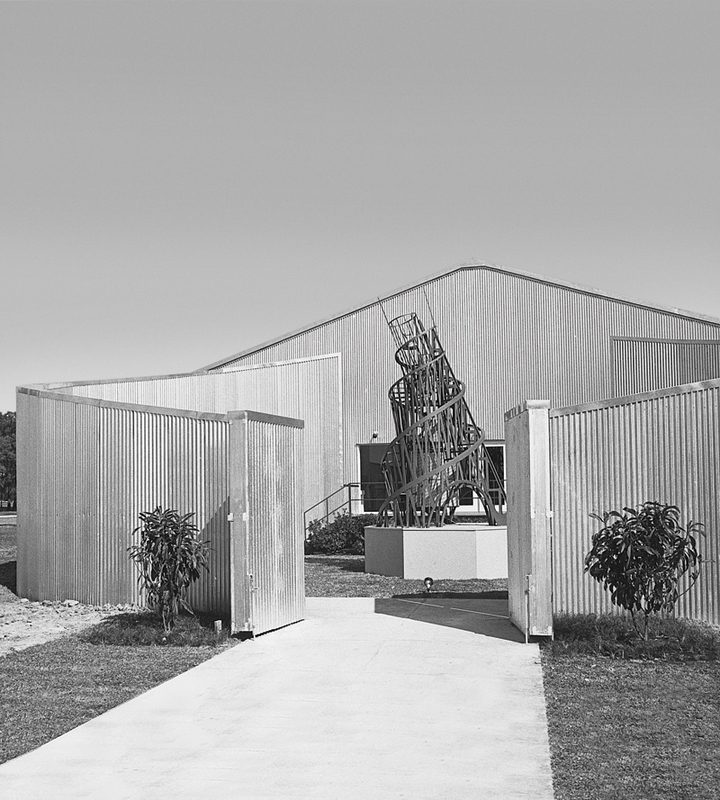 Commissioned by the Franco-American art collectors, Dominique and John De Menil, the Art Barn was legendarily designed and built on the Rice University campus in a period of six weeks. It opened just in time to house a massive art show, “The Machine as Seen at the End of the Mechanical Age,” coming from New York’s Museum of Modern Art. (Amid public outcry, Rice University destroyed the Art Barn in 2014.) Slowly, the image of the Art Barn and its more abstracted tin neighbor directly adjacent, the Rice Media Center (1970), percolated into the consciousness of Houston’s architectural scene. By the 1990s, its Tin House progeny were being written up in The New York Times as a Houston-based building phenomenon of note. Tin House architects seized upon the industrial aesthetic of the Art Barn in producing their un-domestic residential warehouse homes with jutting angles and asymmetrical compositions. 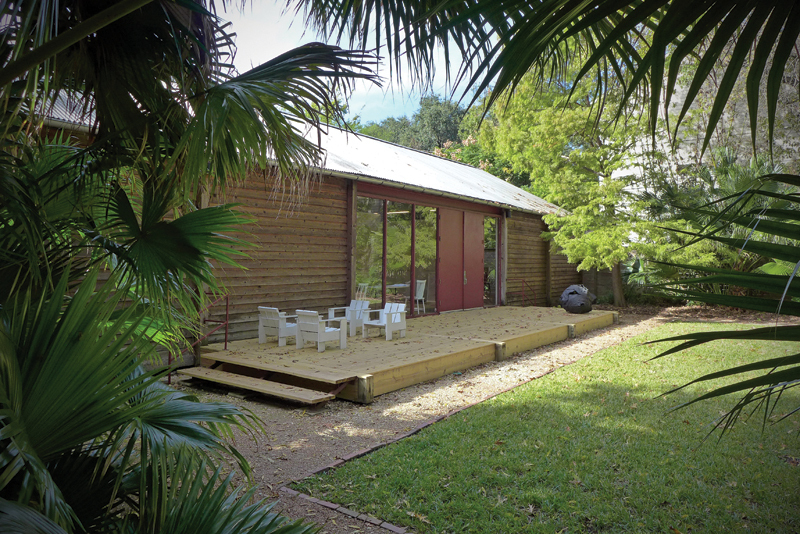 But exterior cladding was not its only contribution to Houston architecture: The Art Barn was also a barn. Its rectangular plan was modular, with five identical bays covered by a continuous gabled roof. The foundation was pier-and-beam. Its elegantly simple geometrical shape and proportions recalled the handful of pre-20th-century vernacular houses still standing in Houston. This direct visual link to the typology of Gulf Coast cottage and shotgun houses seems also to have resonated with a different group of architects and patrons. In 1989, Hiram Butler completed his own art barn — a gallery building designed by Dallas architect Robert van Buren of Phillips/Ryburn with a good deal of client input. Butler’s gallery, located along the western edge of his half-block property, is rectangular in plan with seven bays demarcated on the exterior by wood piers. It is capped by a continuous gable roof. The few openings are full-height glass panels or flat steel doors. The entry doors open onto a low platform covered with wood deck boards. Inside, the plan is mostly open, with partial-height walls marking off three gallery spaces and a central core containing offices and a toilet. A steel ridge beam supported by two perpendicular steel tie beams runs the length of the space inside. Butler and his architect mixed high and low in the gallery building. According to Butler, the bay system, the solid-void pattern of the window walls, the logic of the steel superstructure, the central core, and the platform deck were inspired by the trabeated rigor of Ludwig Mies van der Rohe’s Farnsworth House (1951). Simultaneously the pier-and-beam foundation, horizontal, stained cedar siding, and corrugated metal roof acknowledge the West End, which had an almost rural character in the 1980s when the gallery was built. In 2017, the gallery building received a 25-Year Award from the Houston chapter of the AIA. As the gallery was going up, Butler worked with William H. McDugald, Jr. to rehabilitate a folk Victorian worker’s cottage that had been moved to the southeast corner of the site sometime in the 1880s as his residence. He then began converting the space between the two buildings into a semi-formal garden. Butler arranged these building blocks like chess pieces across the flat site, to create a spatially rich and clearly defined outdoor space. By repeating the same gable-roofed shape in the gallery building, Butler harnessed the varied seriality inherent in the geometry and paired setting of the original Art Barn and Rice Media Center. Cleverly and with a minimum of means, he demonstrated the power of using simple architectural forms to make urban space, a lesson that bears endless repetition in Houston. married to Essex, Massachusetts, antique dealer Andrew Spindler-Roesle since 2007 — decided that the old house was getting too small. A moment of inspiration came when Butler toured the “99K House Competition” exhibition in 2008, sponsored jointly by the Rice Design Alliance and the Houston chapter of the AIA. The creativity and modesty of the designs made the idea of a new house, once remote, seem more attainable. After mulling concepts over in his mind for several years, Butler contacted Houston architect Marshall Reid, AIA, himself an art collector, to begin work on the design of a new house. Armed with a now-lost napkin sketch of — what else — a gable-roofed house, the two began to work out a design. The house as built is 55 ft long by 25 ft wide. 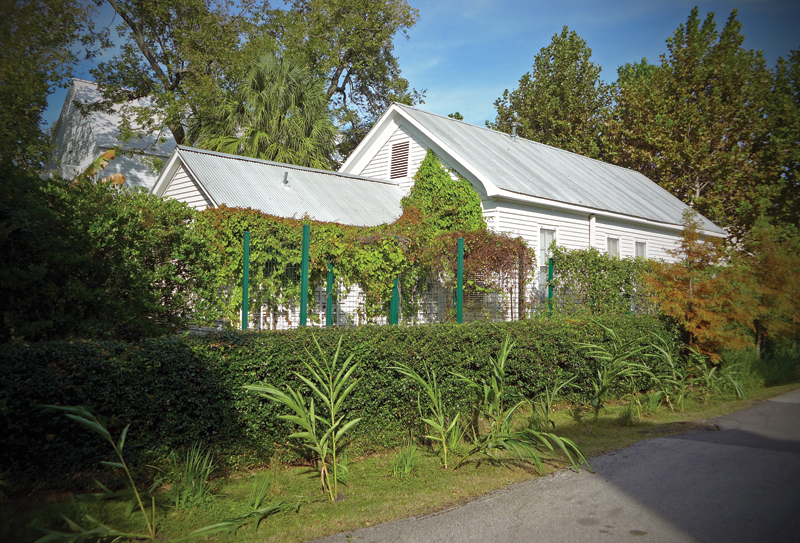 It is located directly north of the turn-of-the-century cottage. Its long north side is aligned with the east-west alley running the length of the block. It has two stories and is capped by a steep-pitched roof that provides attic storage space. The foundation is a concrete slab elevated eighteen inches above grade. The walls are clad with white-painted, smooth cementitious siding. The roof is of white-painted standing-seam metal sheets. The long south side of the new house faces the old cottage. A gravel court lined with sassafras, ginger, and banana plants links the two buildings. A set of large sliding doors accessed by a low deck provides access to the house. The short, east- and west-facing sidings have continuous bands of single-hung aluminum windows. The north-facing elevation is blank, save for two tall, stacked windows that light the interior stairwell. There is no trim and no gutters. Continuous pairs of louvered wood shutters projecting out between each of the windows provide an almost surreal contrast to the severely plain exterior elevations. Butler explains the design decision by saying he wanted something to protect the windows and the contents of the house during hurricanes. He also adds ruefully that the shutters were the single most expensive item in the house. The first floor is completely open. 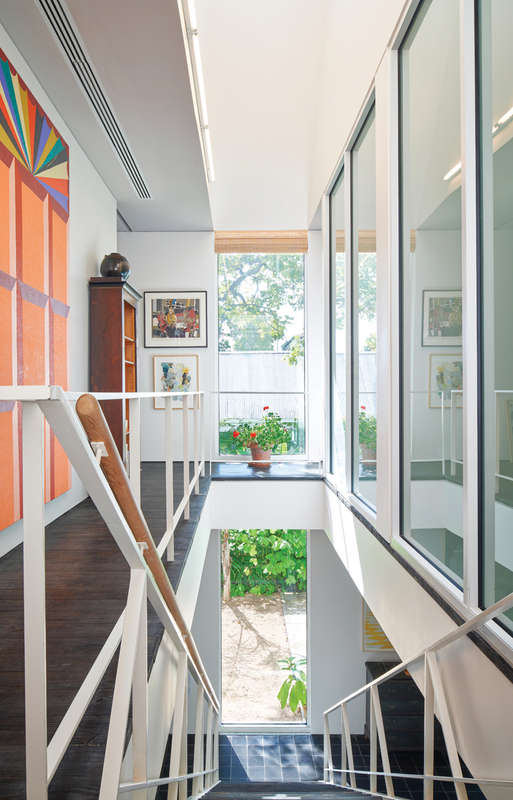 A steel-and-wood stair divides the space into a kitchen area facing east toward the street and a living area facing west toward the garden and gallery. 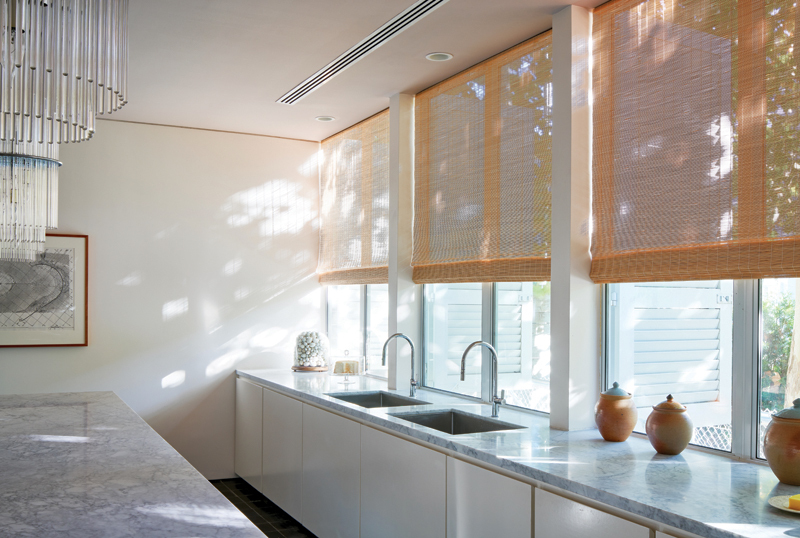 In the kitchen, there are only base cabinets so as not to obstruct the movement of light and air through the space when the windows are open in good weather. The twin kitchen sinks are a suggestion from interior designer Cathy Chapman that Butler says dramatically enhanced his (already formidable) entertaining prowess. The floor is covered with solid black cement tiles that Butler sourced in Mérida, Mexico. 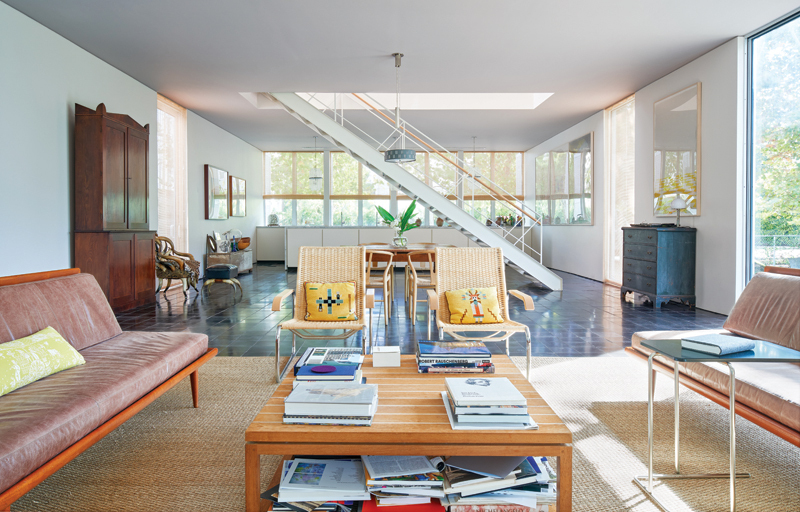 He cites his childhood home in the South Texas border town of Eagle Pass, which had green cement tiles, and the Menil House (1951), designed by Philip Johnson, which has almost identical black tiles as inspirations. On the second floor, the ceiling is vaulted above the stair and is equipped with two electrically-operated skylights for natural ventilation. The floors are black-stained, structural tongue-and-groove two-by-sixes. A guest bedroom faces east, and the main bedroom is on the opposite side of the floor facing west. A bank of windows lets daylight into each sleeping area. 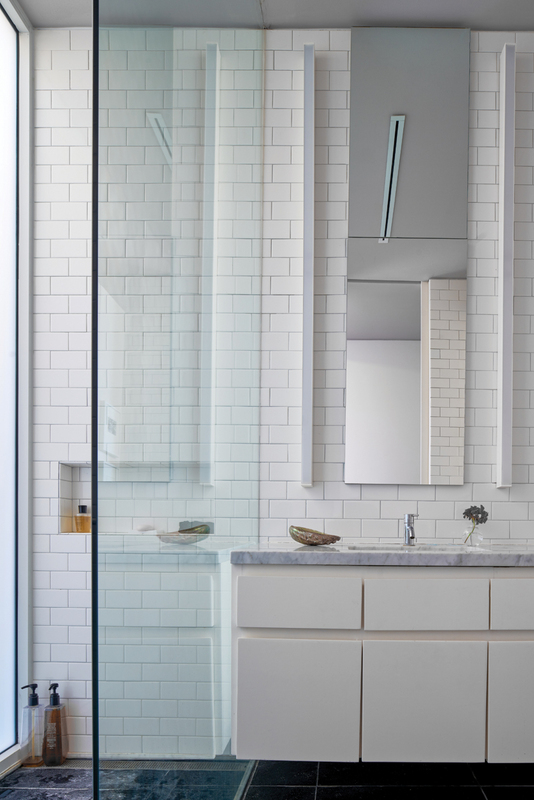 Identical closets and bathrooms that are mirrored in plan fill the center section of the floor. Two continuous hallways run along the long north and south sides to allow for natural cross-ventilation. 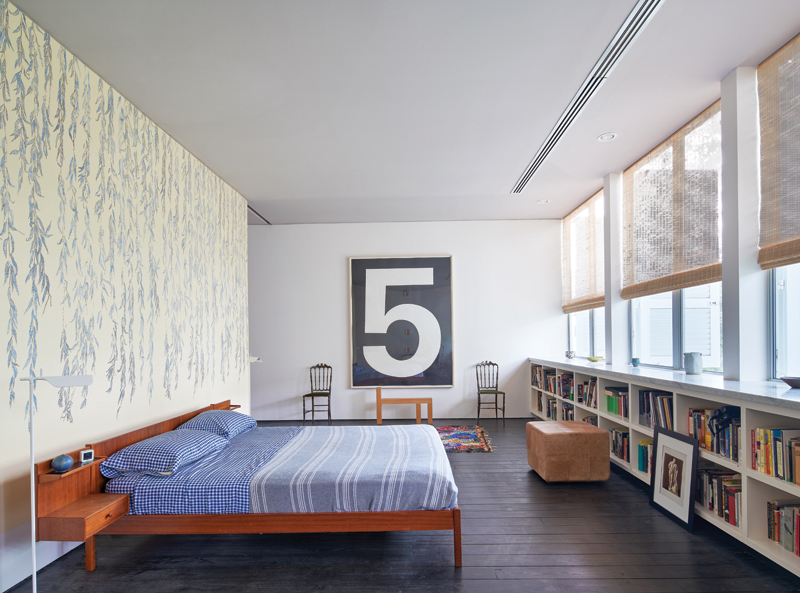 In Marshall Reid’s office, the Butler-Spindler house was quickly nicknamed the “Simple House.” Reid only half-jokingly refers to its particular form as a “housey-house.” The house and its setting show how powerful simplicity and restraint can be when used in such a thoughtful way. Rather than being merely a postmodern conceit, its design seems to draw instead from very specific conditions and historical building typologies. It also brings forward a “regional” building tradition unique in Houston, and as such should be considered as not only a successful work of architecture but, perhaps more importantly, as a prototype for more like it. Ben Koush, AIA, is an architect in Houston. Best house I’ve visited in years.